We had a sad weekend around here. Saturday morning Daisy went down to let the goats out of the barn into the big pasture, and her beloved pet (and new mother) Dixie Trixx was dead. She had just developed some symptoms of illness, and had had one dose of penicillin, but it was too late. Her little kid, Dulcie, was just sixteen days old. Daisy had to start in immediately with bottle feeding. Dulcie spurns the bagged formula but loves the fresh goat's milk we get from the neighbor. Unfortunately, we can't let her out in the big pasture with the other two goats, because she gets underfoot of the donkeys and the cow, and she will get kicked. We've seen it happen twice and it's horrifying. So for now, she's either penned up in a little pen with the other two goats (so she can remember she's not human) . . .
or she's inside in the air-conditioning, while the other goats get a chance to browse the pasture. Either way, she seems very happy. We are so sad to lose Dixie, but very grateful for Dulcie. It is always so sad to lose a beloved animal friend. We have not seen your other cat for awhile. Is Daisy still part of the family ? Oh, what days dear Daisy is enduring with endearing delight. Hugs to all and our deepest condolences for your loss. Very, very sorry. So sorry to hear about Dixie. Very glad that Dulcie is there to soften the sadness. Sister looks intrigued; I hope they are getting along well. On a lighter note, can you tell us about Daisy's dress in the first couple of photos? Did you make it? It looks comfy and not too complicated, like maybe something I could make for my girls. Thanks! Gosh you people are doing it tough with animals this year. I'm very fond of the name Dulcie, it was my Nana's (maternal grandmother) name. Sylvia, I think you're asking after Lucy Gray? Yes, we still have her, but she lives a very quiet life and prefers not to be disturbed. She spends her dy sleeping on Clara's bookshelf, and doesn't like interacting with any of us very much. 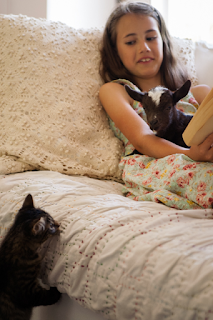 Mallorie, the lavender dress is Daisy's nightgown! I'm so sorry to hear about Dixie. Pets are such a wonderful part of childhood, but can be so heartbreaking as well. Our INDOOR cat has mysteriously gone missing for 2 nights now. She walked by us about 15 minutes before bedtime a couple of nights ago, and could not be found when it came time to put her in her night time room. We haven't seen her since. The windows were open a small nit, maybe 2 1/2 inches, so we don't see how she could have gotten outside... We are all very perplexed and sad. On a totally different note, pictures of Daisy reading always give me such a warm feeling in my heart. Happy belated 11th to her! 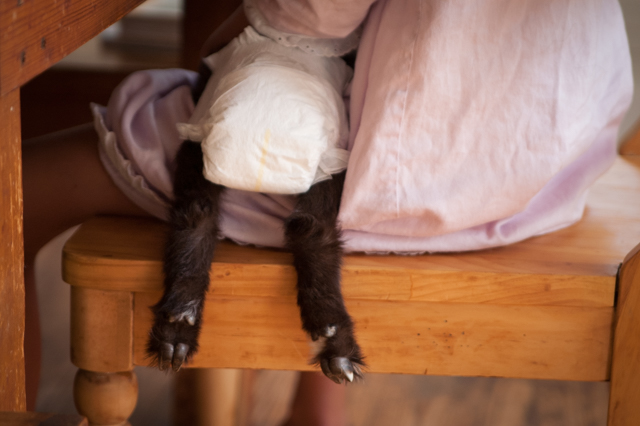 precious little fur baby .. in a diaper. my heart is smiling. love this. so sad you lost dixie though..
How sad - Daisy is certainly learning about the hard side of life, with all these partings. The image of that little creature in the nappy with legs sticking out on her lap is too precious! One of the things we were woefully unprepared for, when we moved 'to the country', was animal death. I am so sorry about Dixie. That is hard. It's good that Daisy knows how to care for the baby, and good that she HAS her to care for. Off topic, sorry. Anna, I can't figure out how to make the tucks on Simplicity 1080. Any tips? Thanks. Sorry to hear of all the cycle of life animal sadness you have all experienced this year. It is reassuring to see a family that cares about their animals the way your family does. So sad to lose a pet. My daughter raised rabbits for several years when she was growing up and learned the difficult lessons of life and loss. I thought so, but I wasn't sure :-) Looks very comfortable. Did you make it from a pattern? Oh that must be so hard. 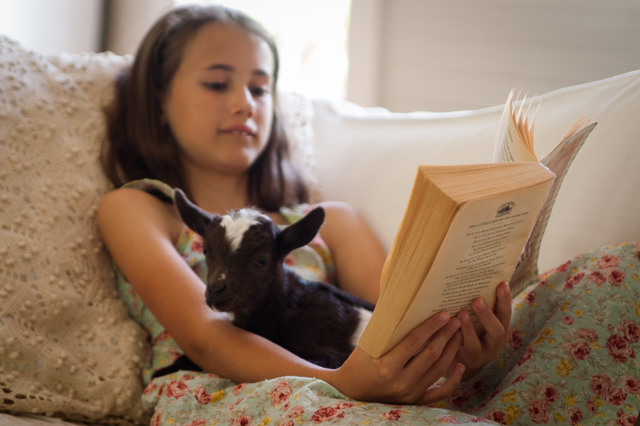 Seeing Daisy holding that dear little diapered goat is so very sweet and comforting. Many moments to treasure, even in times of sorrow and loss. God is kind to us.